Parker Guitars is proud to announce today the addition of the (USA made) Parker Fly Mojo Single Cut to their magnificent line of electric guitars. The Fly Mojo is designed for the professional player, with its Single Cut provides a stunning new edge to their Fly Mojo Series. 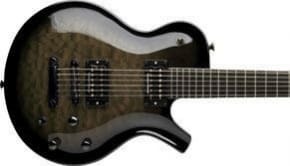 Parker engineers have designed and built the singe cut series from the ground up, employing a solid slab mahogany body and mahogany neck joined together using Parker’s innovated multi-finger joint technology. Parker’s patented design allows the Fly Mojo Single Cut to resist warping resulting in an amazingly responsive and stable guitar with ultimate playability. The Fly Mojo Single Cutaway features Graph Tech Ghost Piezo Saddles on a TonePros bridge resulting in stunning acoustic tones. What’s more, to help amplify the ultimate tone, Parker integrated a Seymour Duncan Jazz humbucker pickup in the neck and a JB humbucker pickup in the bridge. Paired with Parker’s revolutionary neck design, the Fly Mojo Single Cut claims an unrivaled playing experience.